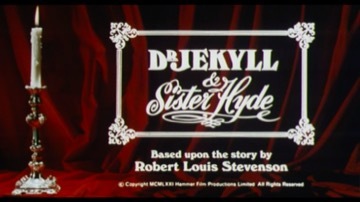 n the course of his experiments to find an elixir of life, Dr Jekyll stumbles on a formula which, when he tries it on himself, transforms him into a beautiful woman, who calls herself his sister, Mrs Hyde. As his work continues, Jekyll is more and more unable to control his female alter ego, who, unfortunately, is endowed with a particularly vicious and murderous streak, which will eventually bring about his downfall. Following the cancellation of the long-running ABC TV series “The Avengers”, which Albert Fennell and Brian Clemens had been producing for years, they moved to Hammer to produce this film and, in 1972, the equally quirky “Captain Kronos Vampire Hunter”. By the time this film was made, Martine Beswick had married former Hammer leading man John Richardson.